Zar Nikolaj 2 kroning i Uspenski Katedralen i Moskva Kreml 26. maj 1896. Nicholas 2., Emperor of Russia 1894 – 1917. 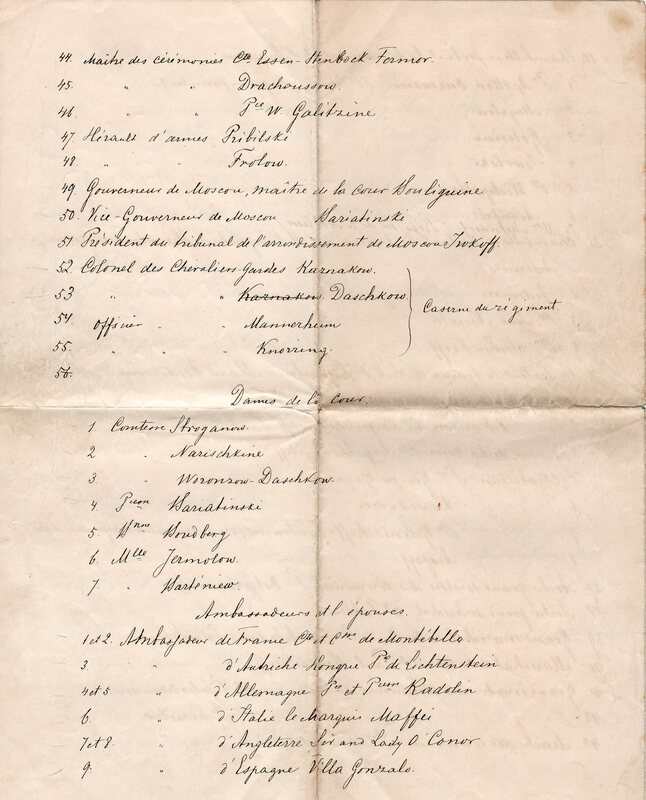 Guest list of participants of the coronation 26. may 1896. 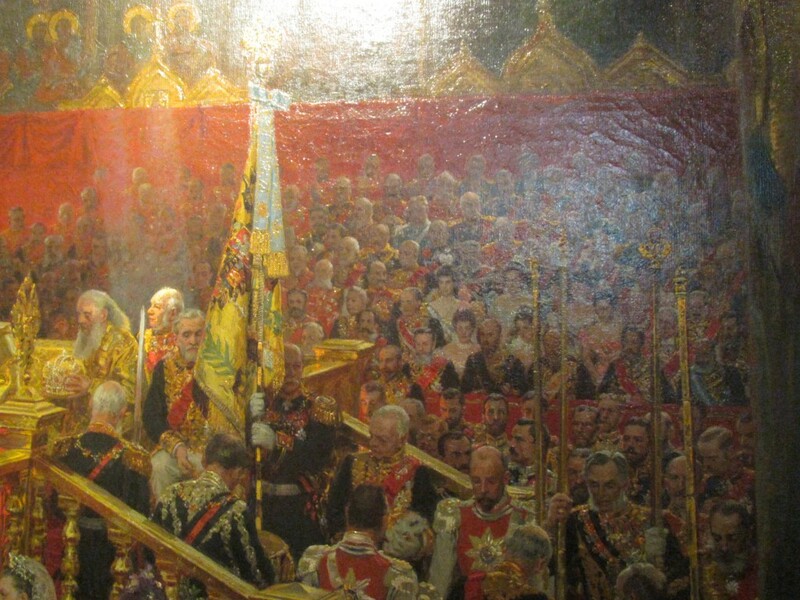 The story behind Laurits Tuxen´s repainting in 1918 of Czar Nicholas 2 coronation. After Tsar Nikolaj 2 of Russia`s abdication 15. march 1917 300 years of Romanov Dynasty had ended. In the revolution in Russia in october 1917 the bolchevics removed the Provisional Government and formed a new Government. 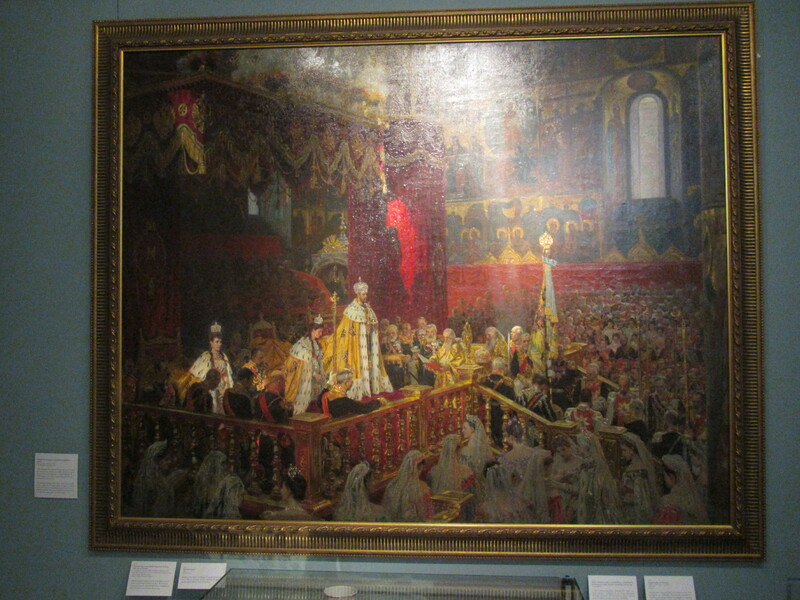 Laurits Tuxen was invited to paint a picture of Nikolaj 2´s coronation in 1896. He finished 2 paintings in 1898 and today you can see them at Pavlovsk, St. Petersburg (142,5 cm x 180 cm) and Museum of Hermitage in St. Petersburg (66 cm x 87,5 cm). 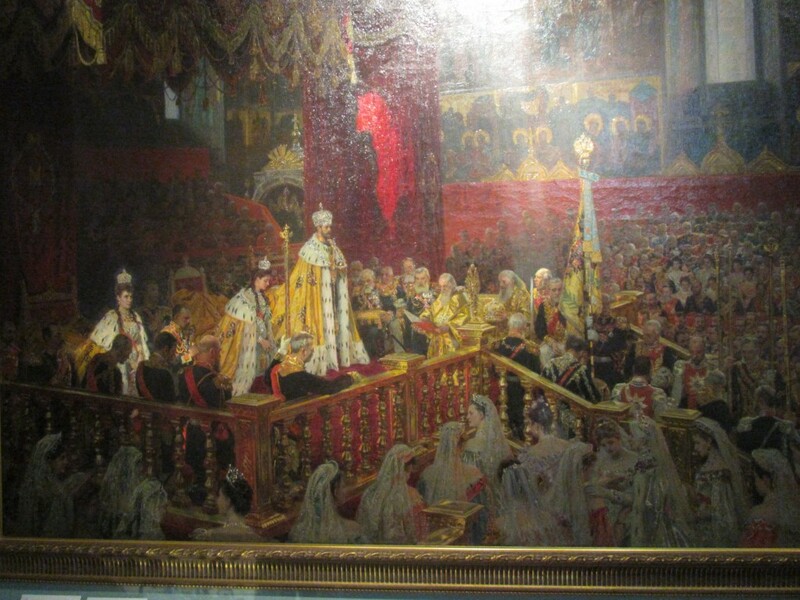 After the russian revolution in 1917 Laurits Tuxen decided to paint a new picture of the tsar Nicholas 2´s coronation 26. may 1896 in Uspensky Cathedral, Kremlin, Moscow. He knew, that he would never see the two original paintings from 1898 again. And possibly the 2 paintings had been destroyed or would be destroyed under or after the bolchevics revolution in Russia. Laurits Tuxen met the tsar family several times and had painted them individually under personal seances in Tsarskoe Selo (Peterhof), St. Petersburg – one of tsar families summerresidences. From 1895-1913 Laurits Tuxen had met and painted all the children of Nicholas 2 and tsarina Alexandra Feodorovna´s 5 children: The Grand Duchess Olga born 1895, the Grand Duchess Tatiana born 1897, The Grand Duchess Maria born 1899, Grand Duchess Anastasia born 1901 and Tsarevich Alexei Nikolaevich born 12. august 1904. The murder of Tsar Nicholas 2, Tsarina Alexandra Feodorovna and their 5 children 17. july 1918 in Yekaterinburg, Russia by the bolchevics was a brutal crime, that shocked people all over the world. Laurits Tuxen was shocked too. 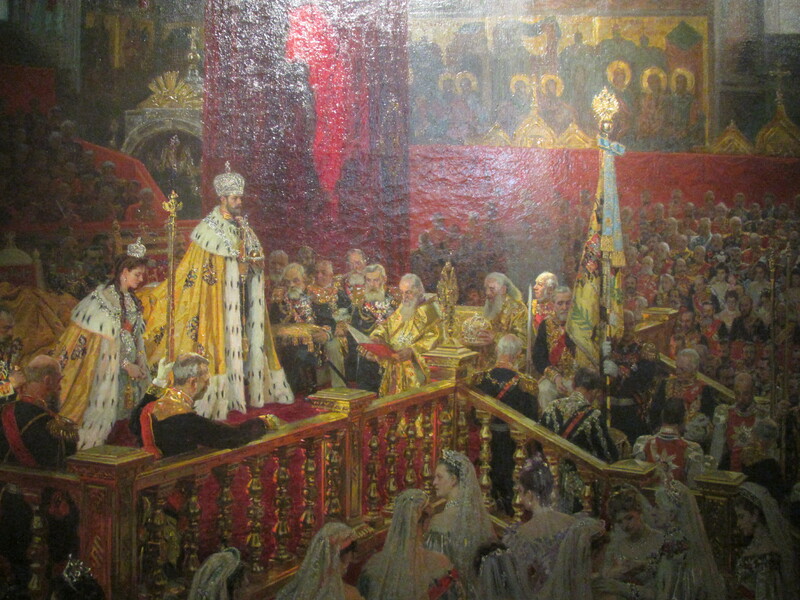 He decided to repaint the 2 paintings from 1898 of the coronation in Uspensky Cathedral 26. may 1896. Painted in 1918 and given to my grandmother Yvonne Tuxen by my great grandfather Laurits Tuxen. 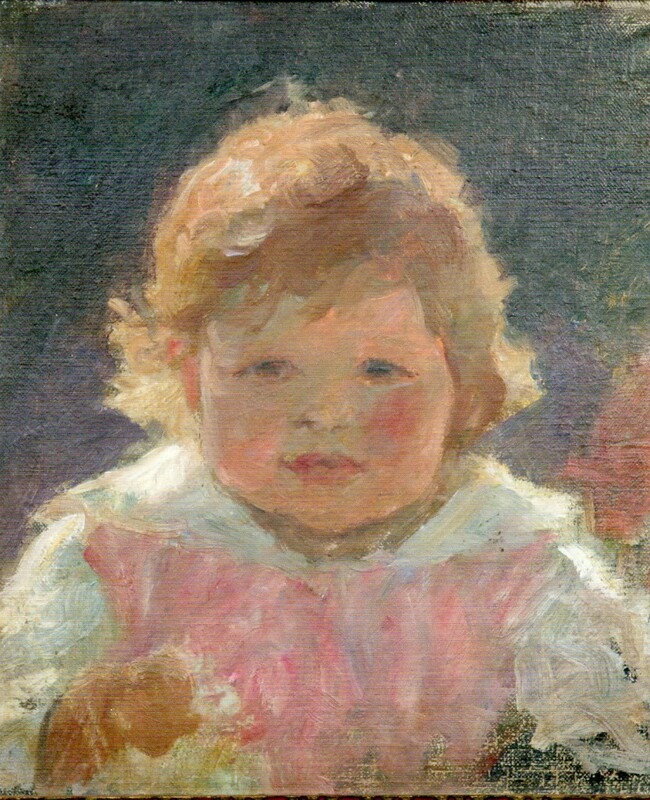 His daughter Yvonne Tuxen (1894-1987) possessed the painting untill her death in 1987. In 1988 it was sold by Christie in London to a private. Czar Nicholas 2 coronation 26. may 1896 in Uspenski Cathedral, Moscow. By Laurits Tuxen (1853-1927), 1918. 137 cm x 180 cm. Oil, coal and coloured chalk. The picture is scanned after a photo. Click on the picture and use your zoom control and you will see it in full screen size. 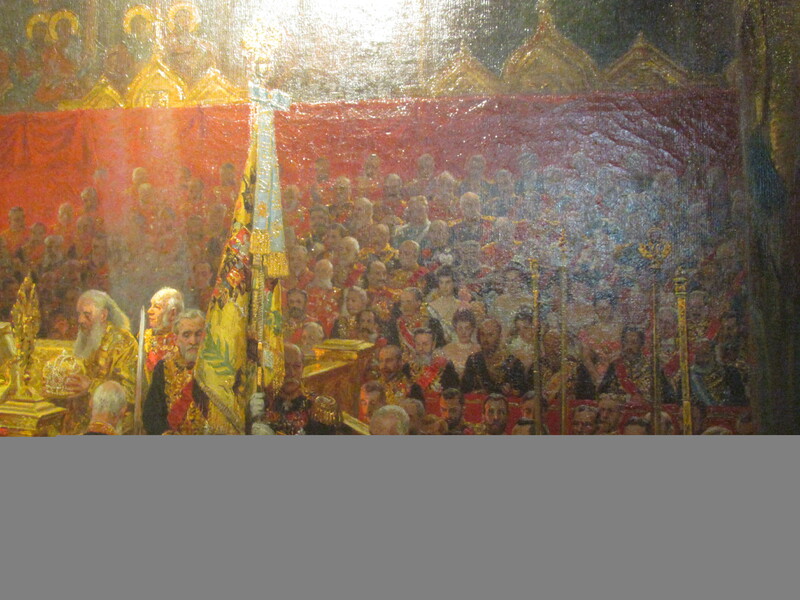 What we know today is, that the original painting “Czar Nicholas 2 coronation in Uspenski Cathedral, Kremlin, Moscow in may 1896”, Oil on canvas, 142,5 x 180 cm. by Laurits Tuxen in 1898 was NOT destroyed under the Russian Revolution 1917-18. The painting is owned by The State Museum in Pavlovsk, St. Petersburg, Russia. Czar Nicholas 2 Coronation 26. may 1896 in Uspensky Cathedral, Cremlin, Moscow. Oil on canvas, 142,5 x 180 cm., painted by Laurits Tuxen 1896-99. State Museum of Pavlovsk, St. Petersborg, Russia. Exhibition “Denmark and the czars of Russia 1600-19oo” in Frederikborg Casle National History Museum, Denmark 29. august – 1. december 2013. Foto by Erik K Abrahamsen 26. november 2013. Guest list and principal plan given to Laurits Tuxen and published for the first time. 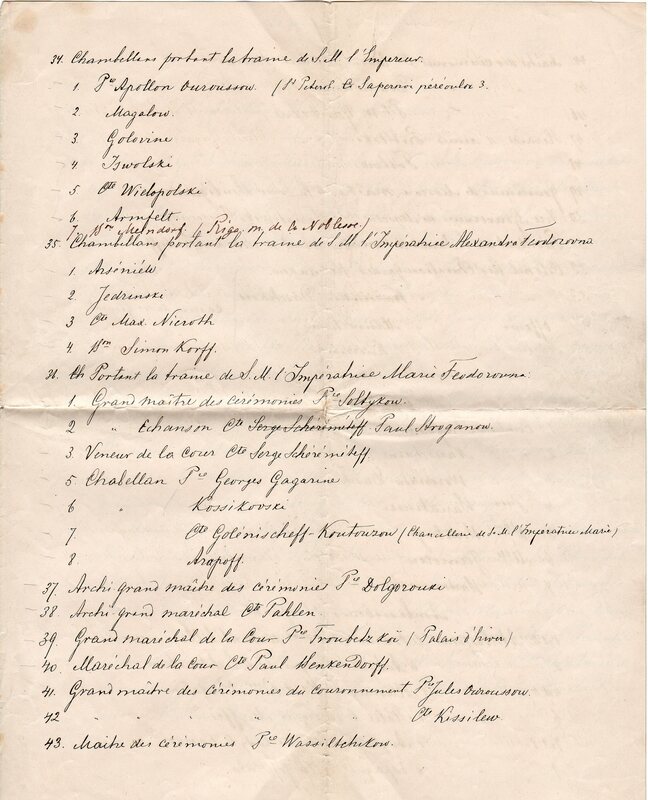 Plan of participants in coronation 26. may 1896 in Uspensky Cathedral. Private. Click on the pictures and use your zoom control and you can see them in full screen size. Guests to the coronation 26. may 1896 in Uspinsky Cathedral. Private. Guests list to coronation 26. may 1896. Private. 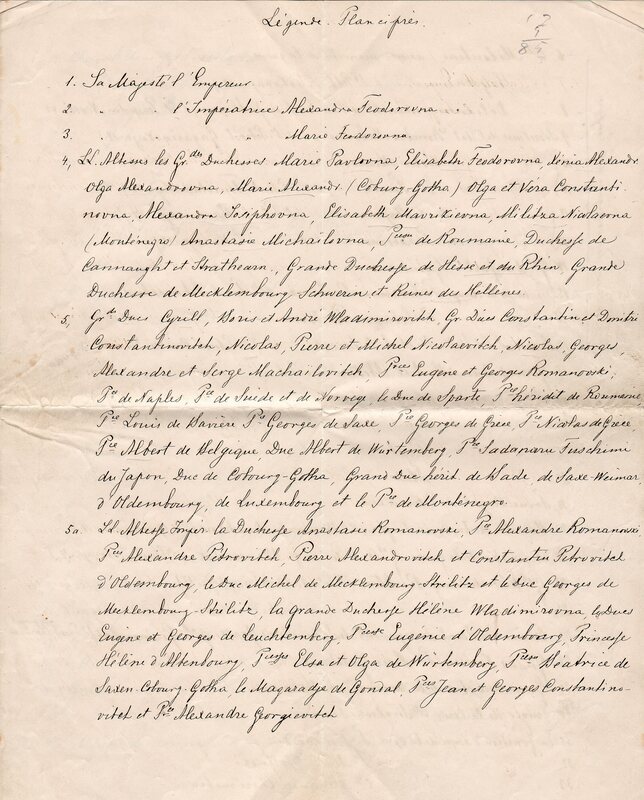 Guest list to coronation 26 may 1896. Private. Guest list to coronation 26 may 1896 in Uspensky Cathedral. Private. 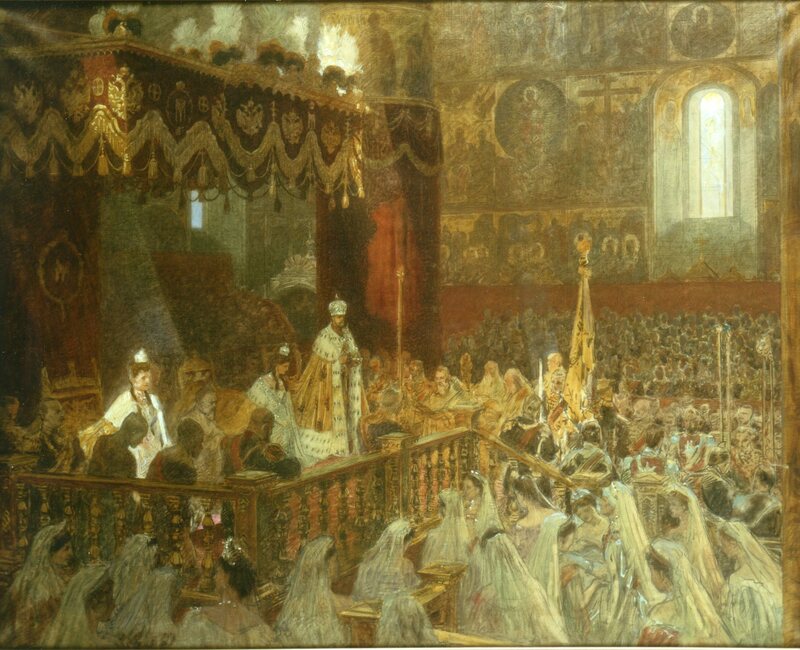 In may 1896 Laurits Tuxen and his wife Ursule travelled to Moscow to attend the coronation of Nikolaj 2 in Uspensky Cathedral in Kremlin 26. may 1896. Here at the coronation Tuxen decided the composition of the above painting. Ursule de Baisieux, 1862-99. 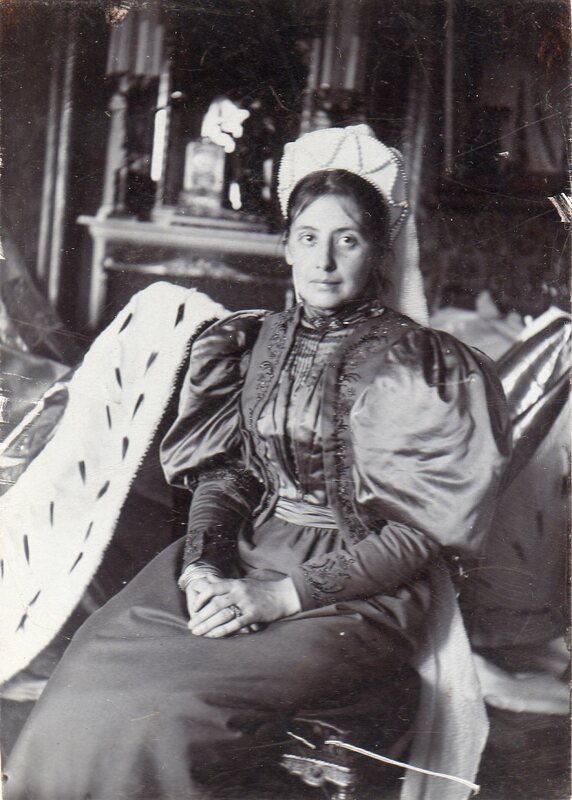 Daughter of Charles de Baisieux (1833-1925) and wife Olympe (1838-1900) born van Calster. First wife of painter Laurits Tuxen (married 1886) and mother to my grandmother Yvonne Tuxen born 1894 in Rebecq, Belgium. Here sitting as a model (tsarina) to the 2 coronation paintings in Moscow by her husbond Laurits Tuxen. Photo: Laurits Tuxen 1896. Private. 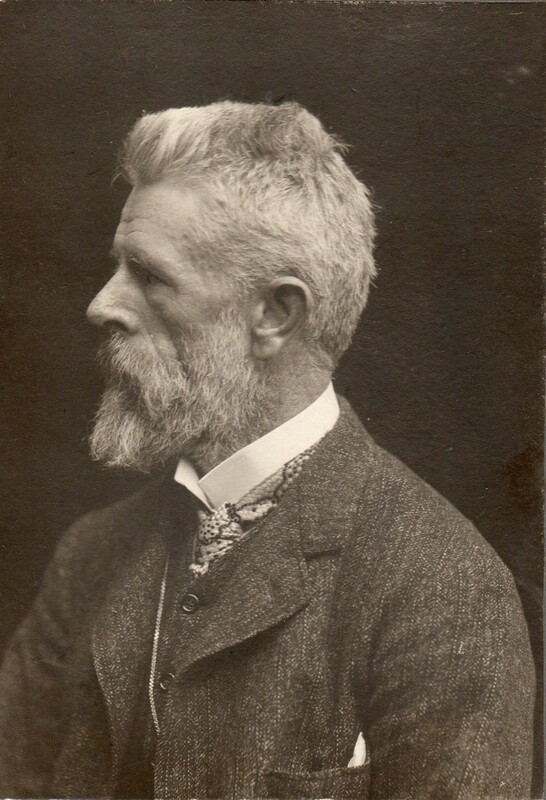 Laurits Tuxen. Private. Maria Feodorovna, 1847-1928, tsarina of Russia, born princess Dagmar of Denmark, daughter of King Christian 9 (1863-1906) of Denmark. 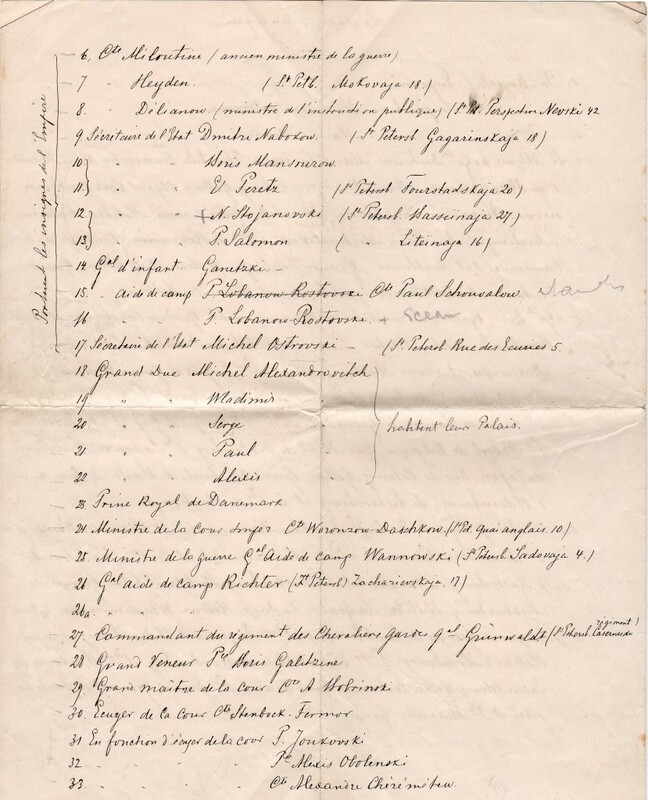 Married to Tsar Alexander 3 (1845-94). Their son Nikolaj 2 (1868-1918) became tsar of Russia 1894-1917. Private. Laurits Tuxen with his wife Ursule de Baisieux became father to 4 girls: Paula born 1887, Elsa (Sasa) born 1892, Yvonne born 1894 and Nina born 1898. They lived in Bruxelles and Rebecq, Belgium. Paula, Yvonne and Elsa (Sasa) Tuxen. Photo: 1894 Hansen & Weller, Copenhagen. Private. 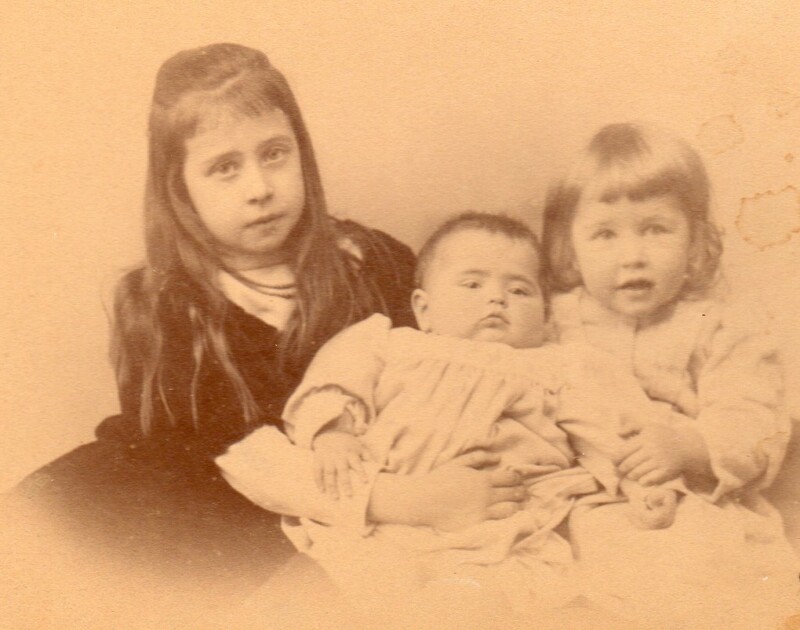 In 1896 Elsa (Sasa) died 4 years old of tuberculosis. In 1899 and 1900 Ursule and her mother Olympe de Baisieux (born van Calster) both died of tuberculosis and the same year (1899) Paula died 12 years old of meningitis. Ursule de Baisieux, born in Belgium 1862 and married painter Laurits Regner Tuxen 1886. Here sitting as a model as Tsarina to the coronation paintings (dated 1898) for her husbond Laurits Tuxen. Photo: Laurits Tuxen 1896. Private. In 1901 Laurits Tuxen married Frederikke Koes Treschow (1856-1946), daughter of landowner Michael Treschow (1814-1901), Fritsøehus, Larvik, Norway. They settled down in Copenhagen, Denmark in Østerbro and since 1909 in Rosenborg Slots Gartnerbolig (Home and studio) and Skagen (Dagminne, summerhouse and studio) with Laurits Tuxens 2 daughters Yvonne and Nina, 6 and 2 years old. In 1870 Laurits Tuxen visits for the first time Skagen, Jutland, Denmark. Four of his best artist friends from the Royal Danish Academy of Fine Arts in Copenhagen P.S. Krøyer (1851-1909), Michael Ancher (1849-1927), Julius Paulsen (1860-1940) and Viggo Johansen (1852-1935 lived and painted in Skagen since 1870 ´and here in the beginning of 1900. In the same period Tuxen lived and painted abroad. Now in 1901 Tuxen decided to join his friends for painting and social compagny in Skagen. Madam Bendtsen Yard in Skagen. Builded 1833-41. Painted by Laurits Tuxen in 1901. Sign: L.T. 26/1-1901. 27,5 cm x 36,5 cm. Oil on millboard. Private. Click on the picture and use your zoom control and you will see it in full screen size. Photo: 2008. Copyright Erik K Abrahamsen 2011. All rights reserved. 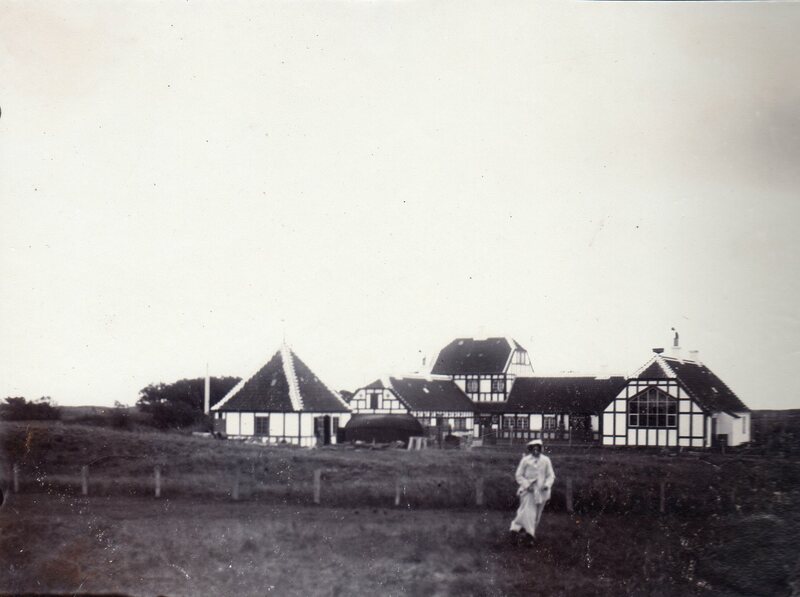 Villa Dagminne, Skagen, Denmark. Summerhouse and studio of painter Laurits Tuxen and his second wife since 1901 Frederikke Treschow. 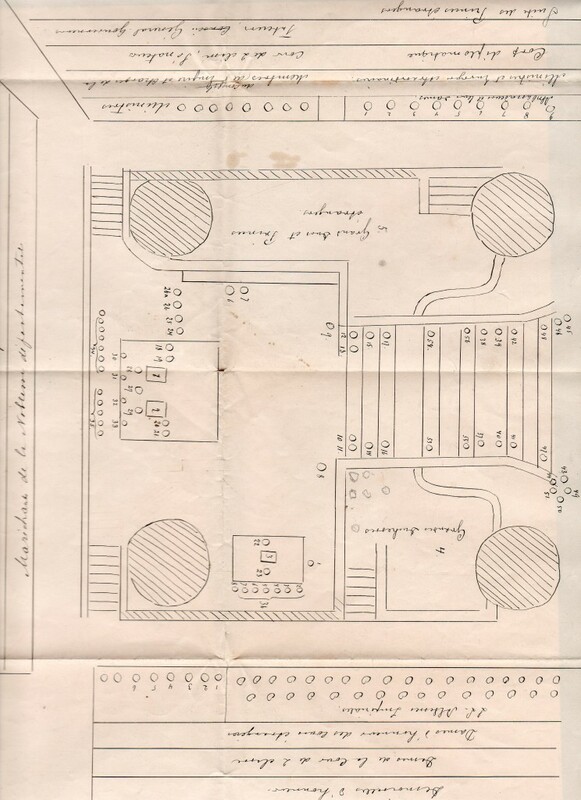 In 1901 they bought Madam Bendsens Yard build 1833-41 and architect Thorvald Jørgensen (1867-1946) draw this enlargement with a second floor between the two former buildings and a new studio as neighbor to the third building of Madam Bendsens Yard and at right in the picture. Photo by Laurits Tuxen: 1903. Private. 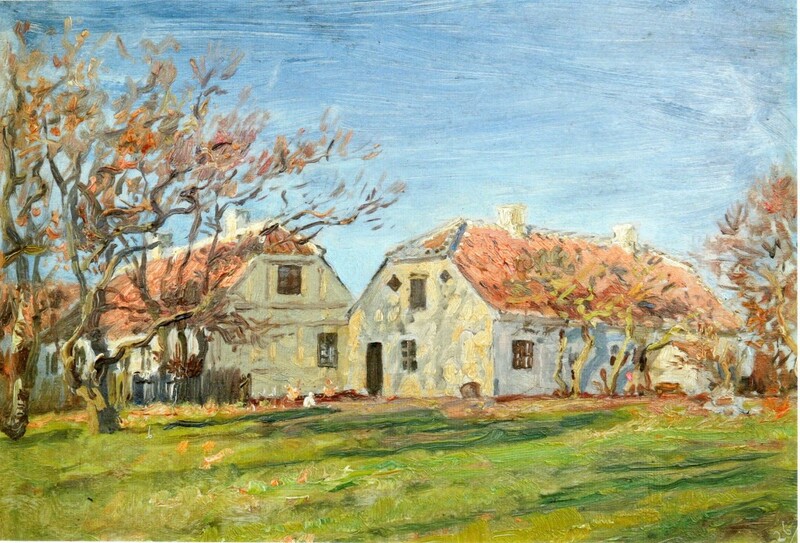 Cheephut in Skagen painted by Laurits Tuxen. Section. Sign. L.T. Painted 1903. Copyright Erik K Abrahamsen 2011. All rights reserved. Private. 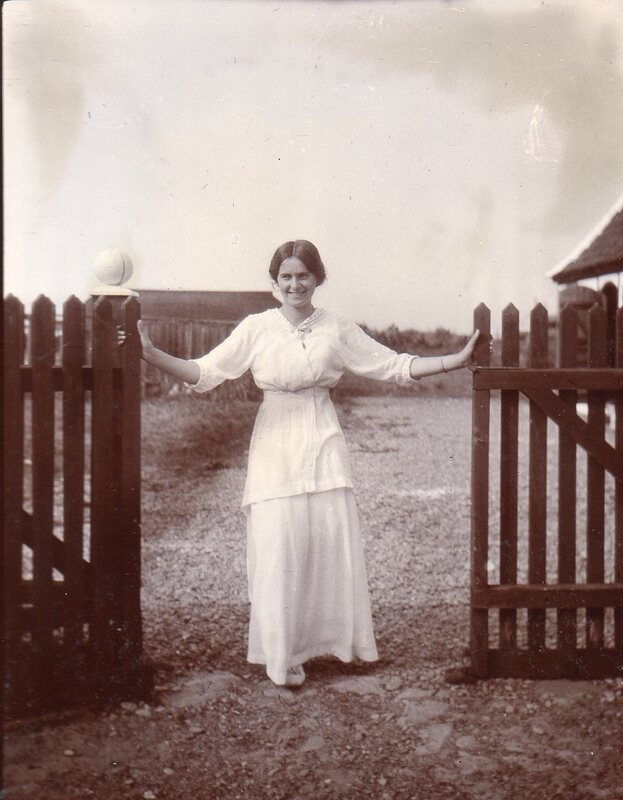 In 1915 Yvonne Tuxen (1894-1987) married Flemming Gustav Voss Wulff (1890-1955) and gave birth to 2 daughters Birthe Ursula, born 1916 and Gyrithe, born 1917. Birthe Ursula and Frederikke Tuxen on Skagen Sønderstrand. 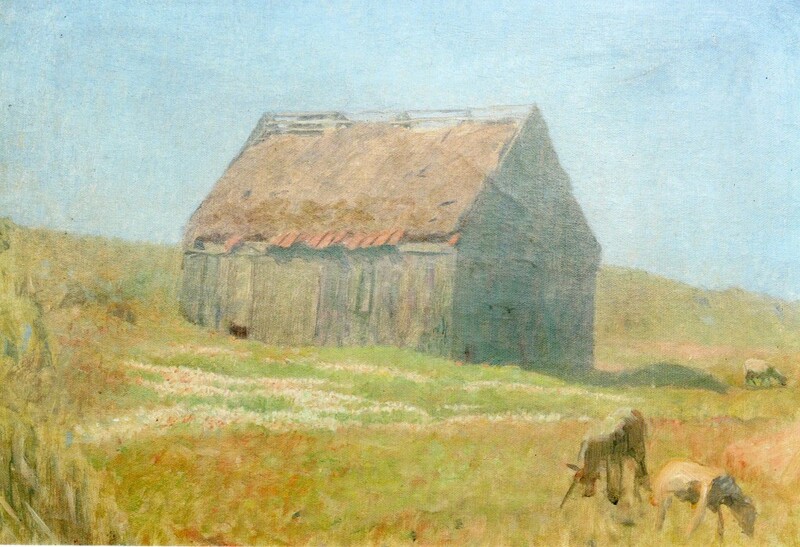 Painted by Laurits Tuxen, 38 x 24 cm, Oil on wood, 1917. Photo: 2008. Private. Copyright Erik K Abrahamsen 2011. All rights reserved. Frederikke Tuxen and Birthe Ursula on the beach in Skagen, Denmark. 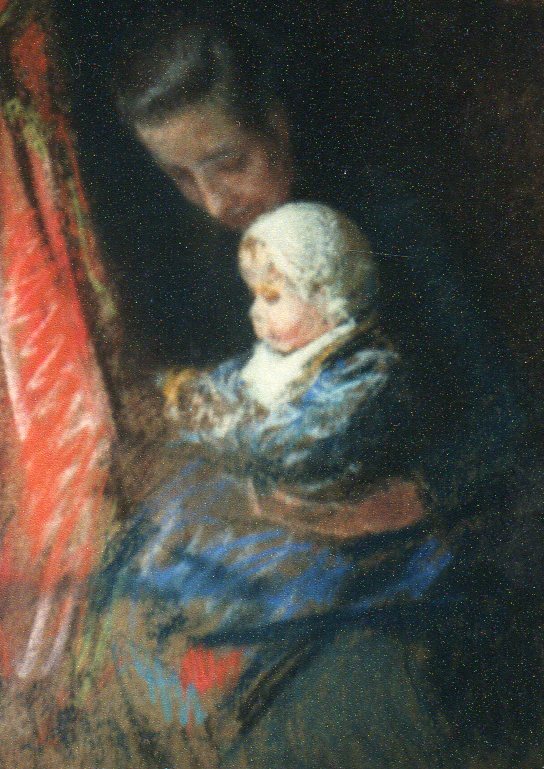 Section of painting by Laurits Tuxen, 1917. 38 cm x 24 cm. Oil on wood. Private. Click on the picture and use your zoom control and you will see it in full screen size. Photo: 2008. Private. Copyright Erik K Abrahamsen 2011. All rights reserved. 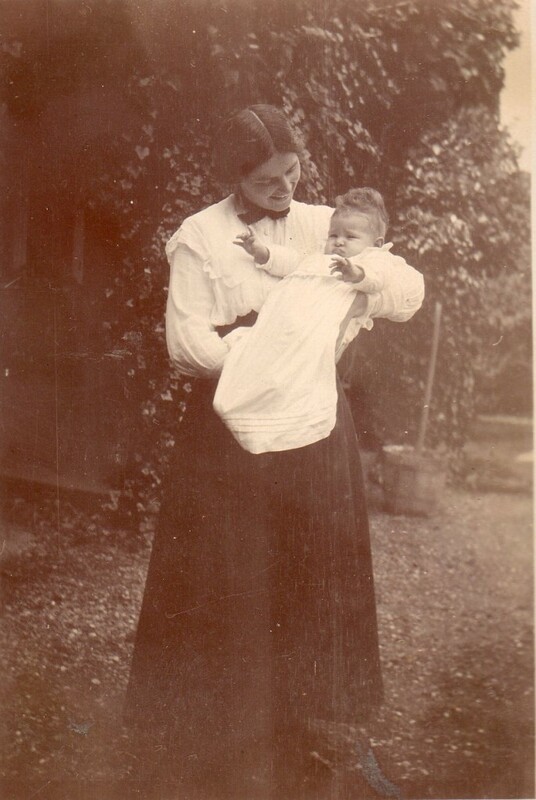 Yvonne Wulff, born Tuxen with her first born daughter Birthe Ursula born 1916. Photo: Laurits Tuxen 1916. Private. 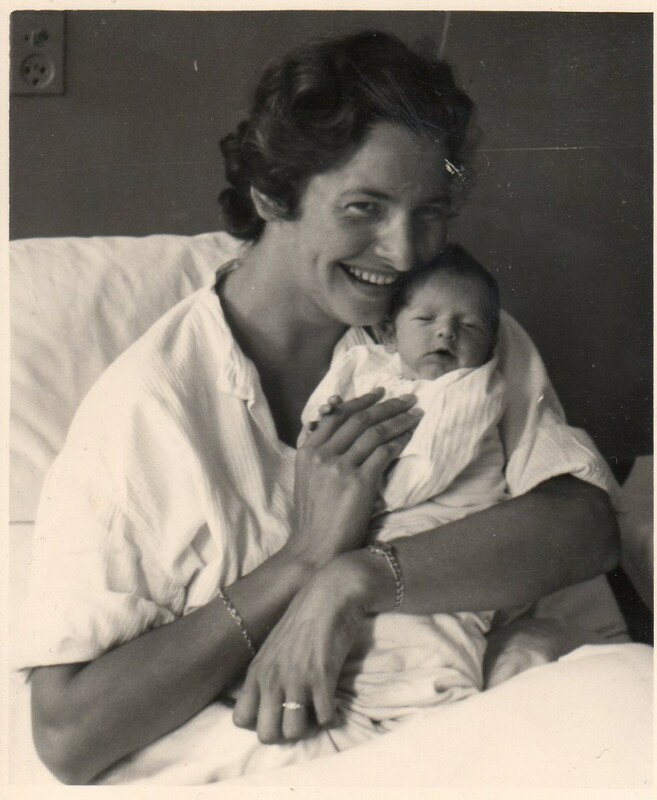 Birthe Ursula Abrahamsen, born Wulff, with me Erik Kristian Abrahamsen, born 4. august 1945 in Skagen 4 days old. Photo: Skagen, 8. august 1945. Private. I have written this article in honour to all the people I have mentioned. 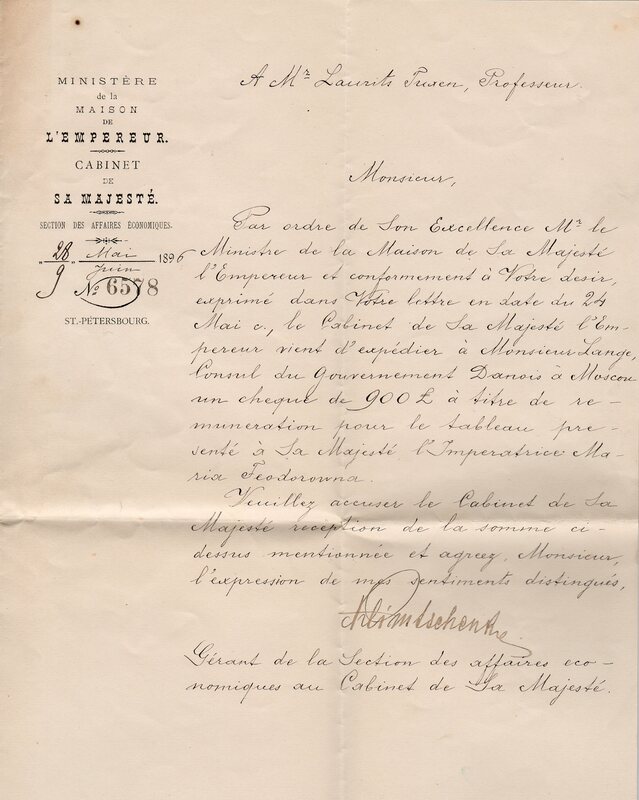 I am an art historian researching the belgian colourman Blockx (artists’ paint makers) and have come across a reference to Tuxen purchasing paints in April 1895 at Rebecq. I see from your article that Laurits and Ursula and their children lived there around that time. Please can you forward any more details. Thank you for your letter. I understand that you ask for information about Laurits Tuxens painting under his living with his family in Rebecq, Belgium. He and his wife Ursule and their 4 children stayed in his parents-in-law countryhouse in Rebecq in 10 years from around 1890 until Ursule ´s death in 1899. Laurits Tuxen painted and drawed numerous works in Rebecq and he had a atelier in the house. The best reference with all his works painted in Rebecq from 1890 to 1899 is: Lise Svanholm, Europas sidste fyrstemaler, Gyldendal, København 1990. In this book you can find all the works of Laurits Tuxen, all in all about more than 1000. From Rebecq, Belgium there are about 23. I together with my two Danish friends have just returned from 4 days in Skagen where we visited Skagens Museum and the Ancher Home and we found it fascinating. So it was with great interest when I found the information above you have shared with all on the Internet. I wonder if you could tell me in the painting of PS Kroyer’s “Summer Bonfire”, to the right hand side he painted your great grandfather Laurits and Mrs Tuxen – do you know if this was Your great grandmother Ursule Tuxen or Frederikke Tuxen? Do you have any information on this particular painting? Also, after the death of PS Kroyer his only daughter Vebike was looked after by your great grandparents, do your family have any memories of her? I find the Skagen painters all very interesting and I look forward to hearing from you. Thank you again for the photographs and detail you have made public. P.S. Krøyer painted “Summer Bonfire”: Sct. 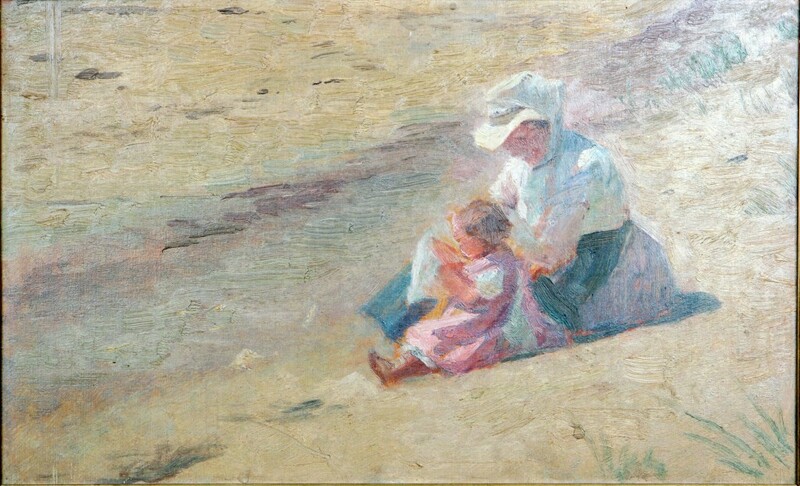 Hansblus på Skagen strand, 1906, 149,5 x 257 cm, Skagen Museum in a period of his life, where he was suffering of manio-depressions with severe hallucinations from 1900 to his death 21. november 1909 in Skagen. 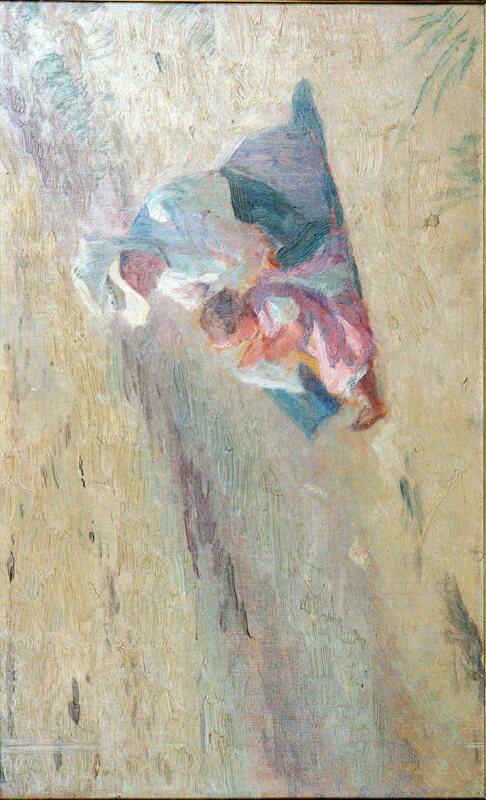 And to paint this composition was a dream, he had since 1892. Cause his sickness it was hard work to finished this painting. Its interesting to notice that on a preliminary studio:” Sct. Hansblus på Skagen Strand”, 1903, Pastel on papir, 141,5 x 264, Den Hirschsprungske Samling P.S. Krøyer did not paint his former wife Marie Krøyer with her new fiance Hugo Alfven and painter Laurits Tuxen with his wife Frederikke of his 2. marriage. Why did he add her former wife ´s new boyfriend and later husbond (married in 1912 and divorced in 1936)? I dont know! Its bizarre or a depressed and sick mans love to her former wife and his wish for her happiness with her future husbond! And maybe Krøyer has placed his painter friend through 40 years Laurits Tuxen with his wife Frederikke (married 1901) so dominant in the right foreground of the definitive picture because of his thankfulness to the Tuxen family under Krøyer severe sicknese since 1900 and his divorce from his beloved wife Marie Krøyer in 1905! Its my suggestions. I have never heard or read about it in litterature or in my family. All informations of the 2 paintings you can find on GOOGLE and search on the two words: “Sankthansblus” and “Sankt Hansblus”. Here you will find all names of the persons on the painting and the story behind written by Skagen Museum. My grandmother Yvonne Tuxen died in 1987 and my mother Birthe Ursula died in 2000 and I have never asked them about Vibeke Krøyer. 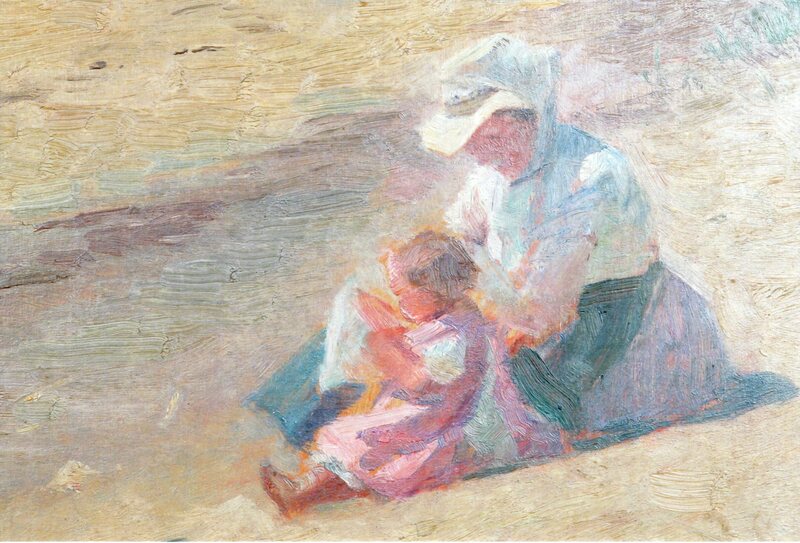 From existing litterature her father Peder Severin Krøyer got the parents right to her daugther after he was divorced from her mother Marie Krøyer in 1905. 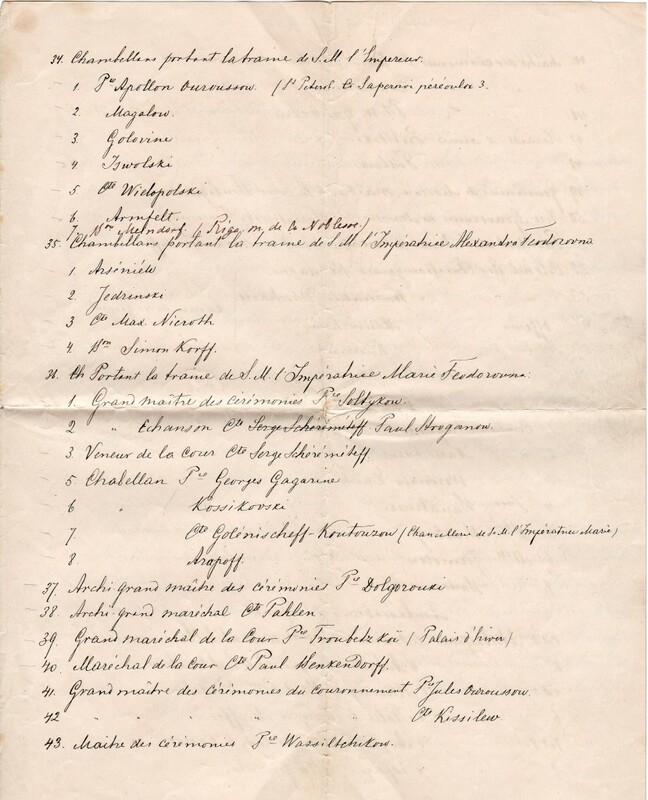 Many people helped Vibeke after the divorce and under the sickness of her father, among them the Tuxen family where she stayed in long periods in Villa Dagminne and was a close friend to Yvonne and Nina Tuxen. Vibeke Krøyer did act as an actress in 6 silent film between 1914-18. She was educated as journalist and worked in Berlingske Tidende in Copenhagen 1921-42. She got married in 1922 and gave birth to 2 sons. In 1962 she inherited her mothers farm “Alfvengården” in Tallberg, Leksand, Sweden after the death of her halfsister Margita Alfven (1905 – 1962). Vibeke Krøyer Dahl died in 1985. I making researhes about russian crown jewels. Maybe you have some scetches or photos made by Laurits Tuxen during coronation of Nicholas II? Thank you for your kind remarks and enquiry. 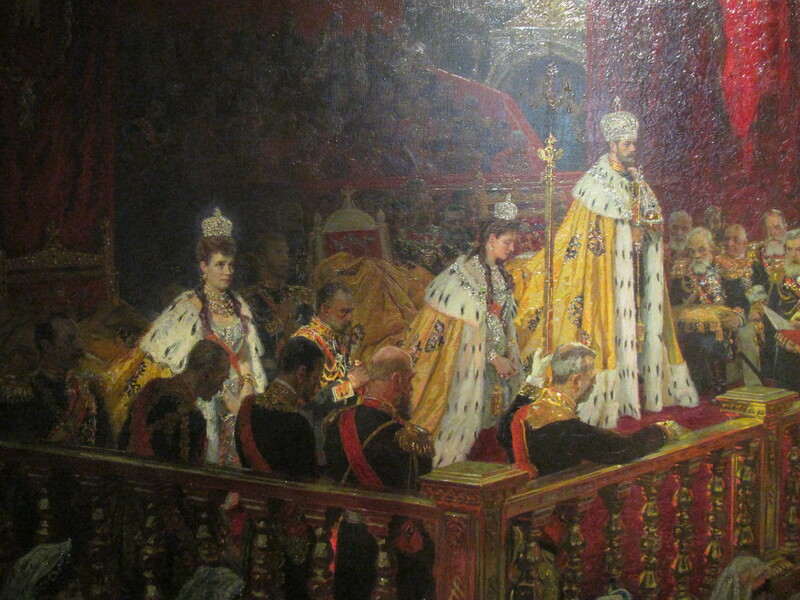 Sorry – I don’t have any scetches or photos made by Laurits Tuxen during coronation of Nicholas 2. Maybe there are some russian crown jewels at the Royal Danish Court at Rosenborg Castle in Copenhagen given as a gift from Maria Feodorovna (1847-1928), zarina of Russia and former princess Dagmar of Denmark and marrried with Zar Alexander 3 (1845-94), zar of Russia. Zarina Maria Feodorovna fled the Russian Revolution via Krim to Denmark and stayed in Copenhagen until her death in 1928. At Christiansborg Royal Castle in Copenhagen is the painting by Laurits Tuxen: Christian 9 and Queen Louise with family in the garden hall at Fredensborg Castle, 1883, 440 x 670 cm with car Alexander 3 and his wife zarina Maria Feodorovna in the center of the painting. Maybe zarina Maria Feodorovna wear her crown jewels on the painting?